I study enough! Its only mid-first quarter!!! 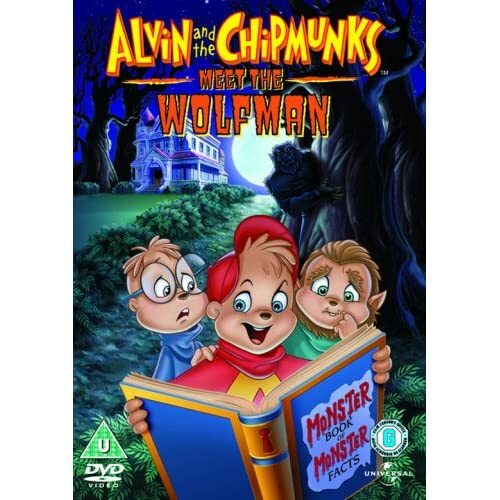 Alvin is struggling with nightmares of werewolves. Alvin believes that the new next-door neighbor Mr. Talbot is a werewolf. Of course, no one believes him. Meanwhile, the boys are working on the school production of Dr. Jekyll & Mr. Hyde. When Alvin blows up the school auditorium, he is expelled from the production. Theodore is put in to rise his lack of confidence. Alvin and Simon are trying to discover the secret of Mr. Talbot. Will the play go as planned or will the Chipmunks mess it up?! And is Mr. Talbot a werewolf? Wow, this brings back memories. I watched this every Halloween on Cartoon Network (before the channel went lame) and recorded iot on VHS, a tape I no longer had till dad picked up the double-feature DVD for me! I just have to say, dear old dad didn't like it as much, what with the mjusic, but, c'mon!! The music was rockin!!! Still, I wish they focused more on Lawrence Talbot, and not Theodore, but it still a fun family, comedic horror cartoon!! I can't speak for the rest of the post, but I agree with this 100%. I hate this documentary because it misplaces the blame. To accuse McDonald's (and other fast food restaurants) of America's obesity problem is ridiculous and lazy filmmaking. McDonald's is in business to make money and if selling fatty foods makes them money, so be it. Good lord, what happened to personal responsibility? Guess what, Spurlock, if you go on a snickers only diet for a month IT MIGHT NOT BE GOOD FOR YOU. You going to go after the chocolate companies next? I'm stopping my rant now. I really hate this documentary. The true problem with this documentary lies in the fact that Spurlock purposely went out of his way to eat unhealthy each day. There are countless scenes where he could have ordered a couple of 1/2 pints of milk to go with his meal, but he chose a LARGE shake or soda. I think he only showed himself once with a salad. For breakfast he always ordered two or three hash browns, instead of just eating the McMuffins, which are probably the most nutritious item on a McDonalds menu. If you wanted to do a true study of their food, and stay within the framework of the parameters of ordering everything on the menu at least once, you would find out the most fattening items and spread those out over the course of the month to lessen their impact. And of course, only order those items once during the study. There is plenty of selection on their menu to make a concerted effort to eat 'healthy'. The last flaw in his experiment, is that he never attempts any form of exercise during the month. Hate to tell you Morgan, but if I eat anywhere, and that includes a vegetarian restaurant, and I eat the massive amounts that you indulged in, then just laid around my apartment, then I would gain weight too. If he had just done 20 minutes a day of exercise, he probably would have only gained have the weight he did. Ok, people are still arguing about this, so I might as well step in. Toward the end of that documentary, he explained this. Turns out, everything he did was because there were a lot of people who did the same. Thats what horrified so many people. Some people do eat mainly at McDonalds and other fast food joints. Some people never put in the exercise either. He also credited that sometimes its hard to tell where the personal responsibility ends and where the corperate responsibility begins. From there, thats our call. I think the movie just opens your eyes to what some people actually do, not just Morgan Spurlock, but actual people. The Chipmunks are working at the amusement park, Majestic Movie Studios, in a singing attraction. Little do they know that the real Dr. Frankenstein are in a new attraction called, "Frankenstein's Castle". After Alvin drives a crazy bus ride, they miss their next performance and get locked in the park after closing time. Dr. Frankenstein figures that the castle isn't scary enough and re-creates the real Frankenstein and after the monster finds the boys, it starts a wild and wacky adventure! But... its a good family movie, and they did do nice things with the good doctor! Sooooooooooo ......... I'd recommend it for the kiddies, But I'd suggest Wolfman first and foremost. The Plot: The villains from the popular animated Disney films are gathered at the House of Mouse with plans to take over. Soon, the villains take over the house and kick out Mickey, Donald and Goofy. It's all up to Mickey and his friends to overthrow evil and return the House of Mouse to normal--or as close to normal as it get's. While I'm still young enough to stomach the playfulness and innocence of this show, I decided to write a review. Then again, who's too old for Mickey and the gang? It's classic! Off the bat, I have to say its a fun movie. Great for the kiddies. Otherwise, its really worth a few laughs. Some shorts I think you all may especially enjoy is "How to Haunt a House" and "Donald's Halloween Scare". Putting Mickey against all the Disney villains is an interesting idea, and there is but one musical number - a rockin one at that! But, oh - - - the Dance of the Goofys?!?!?! The worst of the shorts by far, if not for anhy other reason than seeing Goofy in skin-tight leotards. Wow, has it really been over a YEAR? well, these reviews are long overdue. Death Note has become my favorite anime ever and I want to let the world know what I think about the movies. 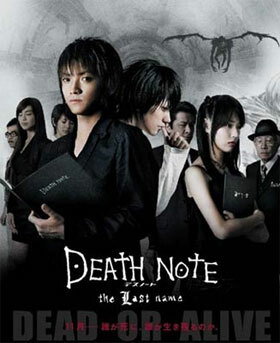 A young man and college student whose life undergoes a drastic change when he discovers a mysterious notebook, known as the "Death Note", lying on the ground. The Death Note's instructions claim that if a person's name is written within it while picturing that person's face, that person shall die. Light is initially skeptical of the notebook's authenticity, but after experimenting with it, he realizes that the Death Note is real. After meeting with the previous owner of the Death Note, a shinigami named Ryuk, Light seeks to become "god of the new world" by passing his judgment on those he deems to be evil or who get in his way. After months of killing criminals, Light is dubbed Kira by the public and some believe him to be righteous about killing criminals. Interpol is no closer to catching him, and is going to pass the case on to the Ministry of Health as some disease, until L steps onto the scene. Known as the best detective in the world, L has solved many cases with his assistant Watari. Working with them, L manages to confront Light, live on TV, and deduces he is in the Kanto region of Japan and he can "kill without lifting a finger." The race begins between L and Light to discover each other's identity, and a game of cat and mouse ensues between the two geniuses. In the second installment of the Death Note film franchise, Light Yagami meets a second Kira and faithful follower Misa Amane and her Shinigami named Rem. Light attempts to defeat L along with Teru Mikami (a Kira follower) and Kiyomi Takada (another Kira follower) but in the end will Light win? or will a Shinigami named Ryuk make all the difference in Light's victory or his ultimate death? You guys may want to ready for one of my not-so-famous rants. As mentioned above, the anime has been one of my most favorite shows ever, even so much that I am currently reading the manga. (And yes, I have also read the novel Another Note: the Los Angeles BB Murder Cases) I watched the series before watching the movies, so I already knew most of the story before watching. But what an I say? To me, it's just that good. And before anyone asks, I watch dub. I don't usually feel like reading my movies. It's more awkward for live action than it is for anime, but I easily adjusted to it. Well, the first movie, obviously, is titled Death Note. There are really no complaints in the begining. It goes just like it does in the anime so far smooth sailing. I was very impressed in the casting, L was just as cute/freaky as ever. Light wasn't exactly as I pictured him, but I got used to it. The Shinigami felt a little cartoonish, but what else were they supposed to do? It's as good as it was ever going to get and I'm happy with how everybody did in this movie!! When it comes time they skip over the epic potato chip eating, but all for the better I suppose - I don't see how people could pull that off in live action. Amazing how that series could make potato chip eating epic!! So, I move farther into this movie and I'm expecting it to go exactly as it went in the anime. Yeah, rookie mistake, I know. I thought I learned better but apparently not. A big critique I have about this movie reveals part of the ending, so if you already seen it read on in the spoiler text, but if not I think this will all be in my conclusion paragraph, so don't worry about it. The way they portrayed Naomi really had me steamed. She was one of the only - - no, she was THE only strong female character in the franchise and the movie completely misinterpreted her. She was a strong women who wanted to benefit society by helping in the Kira case when he fiance was killed. She was bent on catching Kira, but wanted to work with L and work as an FBI agent on the case. How was this done in the movie? She lost it. She made a hostage negotiation like a common broken-hearted, pushed-over-the-edge woman. The lady was crazy and ready to be a killer!! That...that's not Naomi! Ok, I think I vented. The rest of the movie went over without much change. The dough-cabobs L creates due to his sugar-crazed mind had my dad laughing and it's still a running joke between us.There's a cliffhanger for the next movie to enter and yes, I have moved on from Naomi at this point. Still mad, but everything just goes so nicely together I don't mind. So once again the movie sticks very close to the anime, or at least it seems like it at first. I am very happy. The movies don't lose it's beat, the second feels like it's coming right from the first, something that all sequels should have a feel of. Misa, here, has black hair which in the anime was blonde. Some call it a continuity error, some call it a production's creative rights, I call it a good move! As stated above, I hate Misa Amane. She is such an obsessive, stupid, and blind follower that she made me want to cringe numerous times in this movie. And in the anime. And in the manga. And in the fan fictions. And in - - ok, can I just stop there? She's the usual cheerleader type, let's put it that way. I think that by changing her hair color it is veering away from a horrible stereotype about blondes that Amane was no doubt a personification of. I don't know, call me crazy. I just liked that the people in the production were too lazy to make a established character's hair color right this time. So moving on. More good effects. More amazing moments. More amazing L and evil Kira. I loved every scene where L had his mask on so the second Kira wouldn't figure out who he is. It looked so rediculous!! Hilarious!! One more thing the movie had to it's credit? The ending. I was so surprised I spit out my potato chips!! (Yes, I actually did that.) I didn't see it coming and was so glad it happened!!! At episode 24 of the anime, the unthinkable happens. L dies. And so did a piece of my fangirl heart when I saw it happen. He was my favorite character ever in the series. But of course, when I saw the plot come up to it, I expected the same to happen. BUT IT DIDN'T!!!!! He saved himself by....writing his own name in the Death Note. So he would not die by Kira's hand, reveal Kira, and live only for another 23 days. Back to my sadness. I was happy with the ending, of course. Justice was served. I was just realkly really confused. I knew there was a third movie to watch and had no idea what it would be about now that the Kira case was closed. And L was going to die in less than a month. I could not see where the writers were going with this; I couldn't even see where they could fit in a spot for L's successor's Mello and Near. Then, enter the third movie. The spin-off movie, L: Change the World, was something I had no idea what I was going into. This was something completely new and I enjoyed every moment of it. It was like a lost case solved by L!! Here, he had exactly 23 days to stop a virus being spread that was going to eliminate mankind. No pressure!! The begining tied in with the second movie, which confused me at first as it actually showed a clip from before the Kira case, but wasn't too hard to figure out. The special effect that gave off the feel for the virus was just horrific!! I thought I was gonna puke!! Of course, even my dad knows that anything about disease or medical shows or the like and I cower before it. I just can't handle all that, k? But the genuis boy was interesting little girl was so adorable, even when she was very very angry for a reason I shall not reveal. My favorite by far was the scene when the kids try to get L to walk straight!! What I absolutely can't stand about this movie? Near. Yes, the villager boy is supposed to be Near. For those that don't know, Near is L's successor. He is supposed to take over his name after he dies. I don't mind the actors looking a little different from the characters, but they changed everything!!!! Near goes from being a genius albino secluse trained nearly since birth to be next in line to be L to being a villager boy who was a mathematical genius and somehow dragged into the case!!! Aaaaaaaaaaaaaaaaaaggggggggggggghhhhhhhhhhhhhhh!!!!!! I loved the third movie. I really did. That one (albeit really big) change in continuity really had me steamed, though. What can I say? I loved how we got to feel like we were getting to know L outside of the Kira case and him having his own movie without Light barging in somewhere was really great! The movie itself was very nicely done, there are eater eggs for the fans like the return of the 2nd movie mask, the return of the dough-cabobs and potato chips, and things that just hint off at the other alphabet-coded successors when he goes through his e-mail. (Look for it ) Another favorite scene was involving a baked goods truck, but I don't feel like talking about that too muchy tonight. There was no real significance, I just enjoyed it, lol. And the ending.....omg, the ending....it was perfect. L's last line proved to be very quote-worthy. So after all this, why only 4.5 out of 5? Why not go all the way with a 5 out of 5 if I liked them this much? I mean, I've only been on a Death Note rave since I discovered the anime so I obviously love it!! Quite frankly, I think the anime is genius and the movies were a great follow=up to it and really live up to the hype. It is totally worth a 5/5!! These movies are amazing and I would recommend them to anyone!! Thing is, by switching up Naomi and Near on me I just couldn't let this go without docking a few points. Yup, total nerd rage. Seriously though, I would watch these movies a million bajillion times they are so good, or at least I think so. Thank you, and I felt the trilogy/spin-off line was kinda blurry in this case. Lol, my dad just said he hasn't read this yet because its too long and he put it off til later! The Plot: Nick Fury of S.H.I.E.L.D. brings together a team of super humans to form The Avengers to help save the Earth from Loki and his army. My Thoughts: I honestly have been moving away from superheroes this last year or so. I guess I transformed into an anime fan. It's gotten to a point where I need to catalog my anime watching, I cosplay, and just today I started training Pokemon. (link in sig for the last one). Point is, I haven't been the proud Marvel fan I usually am. This movie completely reminded me why I loved Marvel in the first place. The movie was completely action-packed, with plenty of explosions to please all our simple minds. There is a ton of humor, in which I found myself laughing out loud in the movie theater. Seriously, I usually have a poker face when I watch something new. Here, I could barely contain myself. The effects were great, couldn't look better! Some of you may worry about the new actors on set, like say, the new Bruce Banner. Trust me, he did a fine job! I am not revealing any spoilers, but the secret end scene and the usual Stan Lee cameo was hilarious/awesome like in the 5 other movies. Maybe I'm just biased for it 1) being Marvel, 2) being in theater for an awesome effect, or 3) having an awesome theater experience. (Seriously, not a background conversation nor whining baby to be heard ) In any case, the movie was just awesome. I don't even need to pull up my rating pics for this one, you know I'm about to say it's 5 stars!! Ok!! You guys are going to get a little preview. I already have my October marathon planned. The layout and everything. This October I am going to watch a mix of Halloween movies and TV specials that are truly classic (ie, the Ghost Bride from Hey Arnold! - you know, stuff from the 90s I remember ) mixed with a bunch of awesome horror movies that everyone talks about that I've never seen before. On that list is the Grudge movies. I was going to save it for the marathon, but my dad only has the first 2 movies and the 3rd is available for a limited time with our On Demand package, so I'm going to take advantage of it a little early. I figure I'll just copy/paste to start off my marathon in October, unless I'm in the mood for it again. The "scare" quality of it was ok. It only got me by jumpscares a few times - as you can see by the counter - though the first three were within the first half hour, so I guess you can say it kind of declined after that. The Grudge was about as scary as I would suspect and it ended pretty well, though since it's the first of a few movies there wasn't much of a climax. I'm guessing that saved for when people are trying to find a way to break the curse towards the end of the franchise. Overall, the plot confused me a little but it got me a few times so it's still a cool movie! But yeah, I just had an oppertunity to get to the third movie, so I grabbed it. Honest, the rest I'm waiting for October.